Melissa Beauchemin, Director and Leslie Wong, Outreach Coordinator from the Sturbridge Senior Center spoke with us about all the programs and activities offered at the Center – which is a very long list. Among the long list is educational programs, exercise programs, fun programs, fuel assistance, food stamps, help in understanding insurance, Social Security Update Seminars, a flu clinic and the list goes on and on. They also work with the Sturbridge Police and Fire Departments to provide seniors with safety and emergency information kits. Both residents and non-residents are welcome to the Center. No one is turned away and they will try to assist anyone in any way they can. Melissa and Leslie have been working with the town of Sturbridge on requesting new space. The Center is quite small and outdated for their current needs and has limited parking. Sturbridge has a valuable resource with the services provided by the Senior Center. 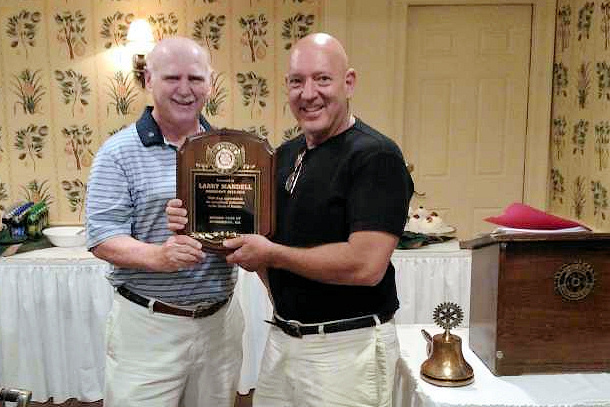 Past-President Larry Mandell was surprised at a recent meeting when he was presented with an award by President Austin Jenkins. Larry was honored for having served as president for the past two years – a term which is traditionally one year only. 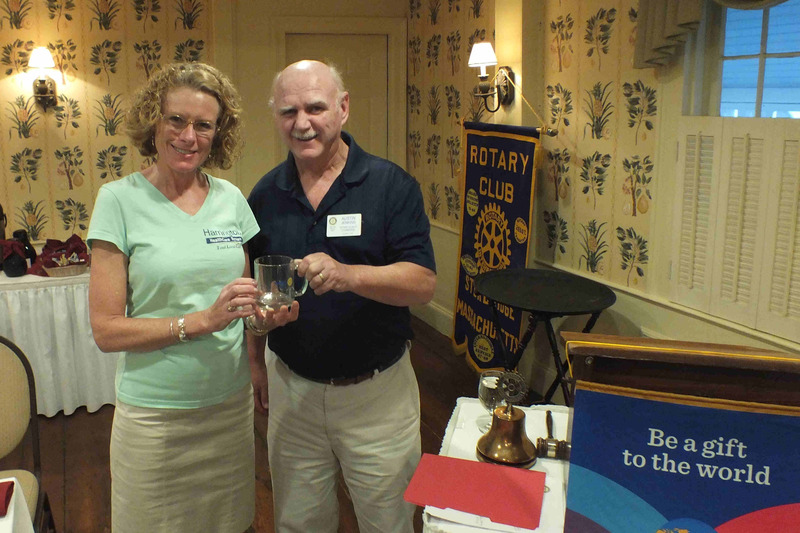 Larry stepped up to the plate and continued to carry on for a second term where he guided the Club in implementing the Visioning Program goals, initiated the Open House to recruit new members and started the St. John Paul II Food Pantry Dinner Dance Fundraiser. Congratulations Larry and keep smiling! 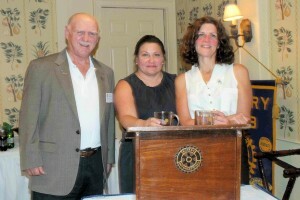 The Sturbridge Rotary Club held its 43rd installation of officers recently. 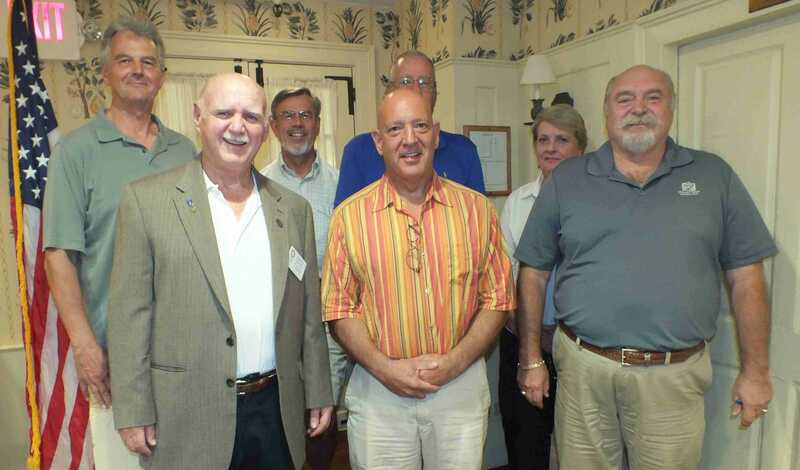 Pictured left to right front row: Austin Jenkins, President; Larry Mandell, board member; David Zonia, Sergeant-at-Arms; Second row left to right: Otto Prohaska, President Nominee; Klaus Hachfeld, Executive Secretary; Ken Jones, Secretary; Lorraine Herbert, Treasurer. The new officers assumed their duties on July 1st for the Rotary year 2015-2016. Betsy Peppel, coordinator of Wellness Education at Harrington Hospital gave a very interesting (but somewhat scary) presentation about skin cancer and skin care. Betsy reviewed the three types of skin cancer and what to look for on our skin. Skin cancer is the most common of all cancers with sun exposure causing at least 90% of all skin cancers. Unfortunately, as we age, our chances of getting skin cancer increases. Betsy reviewed the ways we can protect ourselves while in the sun and urged us to get anything checked that appears unusual on our bodies. The majority of skin cancers are treatable and curable ‘if caught early’. Sunscreen rated at least SPF 30 is best to use often and generously. 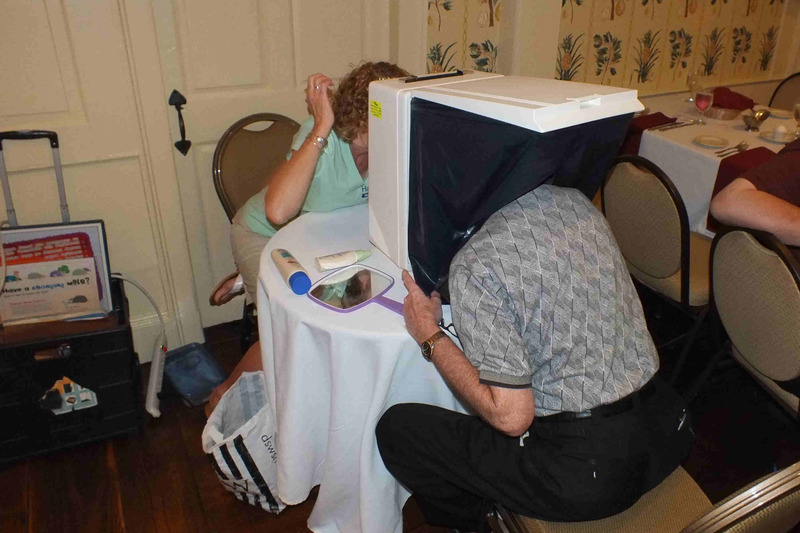 Members took turns sitting at a machine she had brought that detects skin damage on the face. While we have all heard that we need 15 minutes of direct sun each day to get vitamin D, anything longer is dangerous. From now on, we’ll all be more aware and cautious while out in the sun. Bill is having his face checked for skin damage. Brianna Richards spoke with us on Monday about her mission to help young children in Uganda. Brianna was inspired when she became aware of the book “Kisses from Katie” and The Amazima Ministries in Uganda after her sister read it and traveled to South Africa. 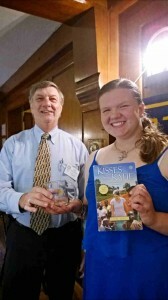 The book was written by Katie Davis describing her experiences going to Uganda at 18 years of age. Katie founded the Amazima Ministries and serves as its Executive Director. It was after learning what Katie accomplished to help the children of Uganda that Brianna decided to help spread the word and to raise funds to help Amazima. Brianna creates tie die clothing, socks and baby onesies to sell at local craft events and has lemonade stands. Last year, she raised $300. Since it was formed, Amazima has expanded greatly to sponsor more than 722 children in education, feed lunch to over 1500 children each day and teach families how to provide for themselves by making jewelry which is currently sold via the Internet. Amazima also has a medical care outreach program, a free nursery, and teaches vocational farming classes. The non-profit is currently in the process of building a school. For further details on the Amazima Ministries and/or to make a donation, visit https://amazima.org.